Its pretty early in the morning, but I just finished working so I thought I would update before I went to bed while my eyes are still open. It was a pretty sad day around VCU 7th floor today. 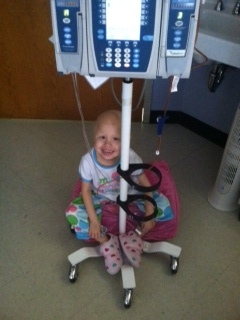 Emily had me walking laps upon laps up laps around the 7th floor today, while she rode the IV pole sitting on her Princess Throne (see picture). At one point we walked past the PICU and a woman came around the corner screaming and crying saying, "He's gone!". There was several men and woman and children that were in the lounge area there all day, but my heart goes out to that family today and tonight and we are thinking about them. I wasn't really sure what Emily took of it, however she really didn't pay much attention to it, so that was at least a plus. Emily and I walked around so many times that we walked by people probably a good 10 to 20 times. Emily and I ran into Astrid, which is Allison Rippy's mom (Allison is going to BMT at the North Building right now) and we were talking about how things were going and what she thought of BMT. While we were talking a man walked up to me and had money in his hand and held it out to me. I thought he thought I dropped it and I replied, oh that is not mine. And he said oh no, I would like to give this to you so that you can go and get a toy for your daughter. My reply was no thank you, but he wanted to give it to us and all I could say was, Are you sure? I thanked him several times and thought what an amazing man who behind him was a woman and a child which I would assume was waiting for him that would do something like that. So, thank you so much so the man who went out of his way, our family really appreciates your kindness. Like I said I was pretty shocked that it happened, but very appreciative and we are still very appreciative. Thursday went well with Emily. She had a pretty good day, no more getting sick, however mostly I noticed she was more tired yesterday than she has been all week. She is still doing very well and taking her Life Mel Honey, Glutamin and Traumeel and she is still eating, just not eating as much. So, we are doing pretty good so far. Dr. Goddar did request to have her counts checked just to make sure she didn't need any transfusions and if she needed anything at least we could have gotten it done yesterday instead of waiting until the Friday when she was to be released. Her counts came back still very good, so she didn't need any transfusions and she just keeps ticking along. 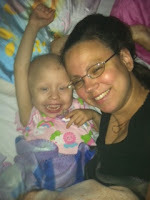 Emily is still on track to go home Friday. Chemo should be finished around 130 so we were told that we should be able to head home no later than 3ish. Last night Emily had a melt down while Daddy and Brianna was here crying to go home. This was the first time all week Emily actually cried to go home, so she did really well on that. We were able to calm her down and I was rubbing her head, but she was ready for daddy to take Brianna home because Emily was tired and ready to go to sleep for the night. Looking forward to getting back home and spending some time with our family. We miss a lot of family time while we are here and the rooms are so small, you really don't have a lot of room for visiting and stuff, so it makes it difficult. But we enjoy the time that Daddy and Brianna are here with us because we do miss them so much.l Thank you Daddy for Dinner tonight. Today I was a bit on edge because we had student nurses here all day. I woke up to 2 nurses (or whom I thought were two nurses) holding the chemo that was hanging up discussing it and I realized it wasn't red anymore. So, I was a bit freaked out and started asking questions when then I was told she was only a student nurse and the other nurse was the instructor. I just felt on edge today while they were there, watching their every move and making sure they are doing things right, but they came in here an awful lot to clear the pump. I mean it was every hour on the hour, which was a bit overboard. Anyway, I spoke to our actually nurse and told her I didn't feel comfortable that the student nurse actually do the blood draw (and mess with Emily's line especially while on chemo when her counts are going to be dropping soon...I would rather be safe than sorry) but our nurse understood and told the instructor and the instructor actually did the blood draw and as you know I watched every moment. I just can't chance a student nurse not doing something they are supposed to do and it be on Emily. But there was several times that they got me all nervous, so needless to say at the end of the night I was happy that they were going home and we would only have Emily's night nurse. Well that is all I have for tonight, eyes are starting to get very heavy now. Thinking of all those family who have lost their children and all the children who are fighting childhood cancer. Please make sure you love and hug your babies! Good night. Our thoughts and prayers are still with your family. God bless you all! SENDING MORE WARM HUGS EMILY. Shannon, you are an amazing mother and I thank you so much for the updates on Princess Emily. She is such a beautiful, tenacious young lady. We keep her in our daily prayers. Sending love to you and your family!